The Android 7 #Nougat update for the Samsung Galaxy #S7 has been one of the most anticipated updates this year as both Google and Samsung promised there should be significant improvements to the overall performance of the device as well as other features. However, anticipate turned into frustrations when some of the owners encountered even more problems after installing the update. We may be tempted to think it’s an issue with the update but we really can’t be sure if it’s really the case without troubleshooting. Now, before anything else, if you have other issues with your phone, make sure you drop by our Galaxy S7 troubleshooting page for we have already provided solutions to hundreds of problems reported by our readers. Odds are that we may have already provided a solution to the problem you currently have so try to find issues that are similar with yours on that page and feel free to use the solutions we suggested. If they don’t work or if you need further assistance, fill up our Android issues questionnaire and hit submit to contact us. Problem: I have the Galaxy S7, which has recently been updated to Nougat and since then I cannot view my texts nor send one as the error “Unfortunately, Messages has stopped” keeps popping up. This is the first time I encountered this issue although I’ve already updated the phone several times since I got it last year. Is there something I can do to fix this? Thanks. Troubleshooting: The error message actually tells you that the built-in text messaging app is crashing for some reason and since you’ve recently updated your phone to Nougat, there’s a possibility that it’s a firmware issue. Below are some procedures you can do to narrow down the problem. When Samsung Galaxy S7 logo appears, release the Power key and immediately hold the volume down key. Continue holding the Volume Down key until it finishes its rebooting. When “Safe mode” appears on the screen immediately release the Volume Down key. If the error doesn’t show up in this mode, then find the apps that are causing the problem. Begin your search from the recently installation or during the time when the problem began to show up; one of those apps maybe causing it. Assuming the problem still occurs in safe mode, let’s not reset the app that’s specifically mentioned in the error. This way we can be sure that it’s not its cache or data that’s causing the problem. But please note you may lose your text messages when you do this but there’s no other way now. From Home screen, tap App icon. Tap Applications and Application manager. Tap Clear cache and Clear data, Delete. If the error still shows up after this, then move on to the next step. None of your files and data will be deleted but this procedure is as effective as a reset when it comes to firmware related issues especially ones that occur after an update. This is the culmination of our troubleshooting and you only resort to this procedure if all others failed to fix the problem. The error message “Unfortunately, Messages has stopped,” while its effects may pose that it’s a serious issue, is actually just a minor problem and can be fixed by a reset. However, we have to undergo the previous procedures to save you from the hassle of backing up your files and data before the reset and restoring them after. But since we have no other choice, then backup everything you don’t want to lose and follow the steps below. Problem: I have my Galaxy S7 on wifi mode and since this morning my text message is not responding and I can’t see, send or receive text. My email and internet are working fine. Solution: One of the possibilities to consider that your phone is unable to send and receive text messages (SMS) is the network coverage in your area–it might be weak. Meaning, if the amount of data that the device is receiving from the tower is insufficient, then that would be the reason that the issue is happening. But before jumping to the conclusion and calling your service provider, try first checking the device for there might have had other factor caused it. Since, the issue occurs without apparent reason it is possible that a glitch in the system caused it. Through restarting, its system will be refreshed and all apps that runs in the background that might triggered the problem will be closed as well. Just press and hold the Volume Down and Power keys together and wait for 10 seconds until the device boots up. However, after the procedure and you’re still unable to send and receive text messages you can proceed to the next method. After restarting and still you can’t send and receive text messages (SMS), then you can check the notification bar to determine if your phone is getting sufficient signal from the tower. If you only have 1 or 2 bars that may be the reason that the problem occurs. If this is the case, you can go to an open area and observe if the signal bars will increase. If so, try to send a text message on your phone number and if you can receive it, then obviously it is the poor coverage that caused the issue. But while in an open area and still has poor signal, you can immediately call your service provider for it might be a network issue. 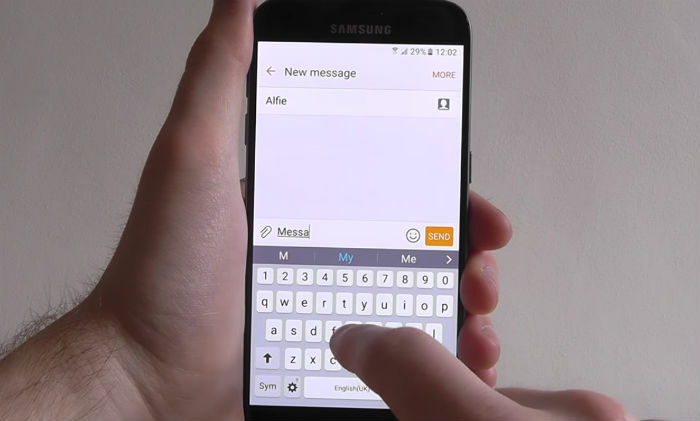 Find and touch the Messages app. Of course, if the problem still occurs after the reset, contact your service provider as it now appears that the problem is more of a network issue than anything else. Solution: Hello Greg! The Access Point Names (APN) is a built-in settings in your device and responsible for connecting and synchronizing the device automatically to the network once you send photos or special characters to other phone numbers. So, if APN settings was changed or has a missing character,then that could be the reason that you are unable to send a picture message or special characters that contains photos. But as you stated that it is an unlocked Verizon device before you purchased it there is a possibility that the APN that your phone is using now is the Verizon APN. So, if you are in a different carrier, then obviously it won’t synchronize to your network. In this instance, the best thing that you should is to call your service provider and let them configure it to their system. However, before calling your service provider you can try fixing the device on your own for it might be a firmware issue. The first thing that you should do is to check the signal bars of your phone by going outside from your room or house. If the signal bars are full and the problem is the same, you can perform the force reboot on your phone to refresh its system. But if there’s no progress after doing so, try clearing the cache and data of the messaging app. Lastly, if the first two methods won’t fix the problem, then you don’t have a choice but to reset your phone. But take note you should transfer all your files to your SD card or your Personal computer before resetting the device. My phone was working fine before the update. Now when i first boot up my S7 and try to send out a text it says pending. looking for signal. i have to make a call out then it finds the signal. i have to do this every time i turn my phone on. its the update not casche or sms or provider signal. time for a new update. I am having the same problem with the sending of text and getting message failed. My phone was just upgraded last night. Has anyone found a fix? I have the same issue. Text is sent – receiver gets the text – error message states text was not sent. Second text will not go thru until the timeout occurs for the first message. This all started with the new upgrade G930VLUDU4CQG1 on Aug 2017. I have done the factory reset and still have the issue. Ohhhhh thank God, I thought I was the only one! My S7 updated yesterday (8/16/17) and now when I send a text it says “Failed to send” even though the recipient is receiving my message! Has anyone been able to find an actual fix? My s7 just did a software upgrade and now it says my plain texts sending failed. I can receive and apparently others receive but because of the sending process taking forever just to fail it I cant send out multiple texts. Its frustrating. I called Samsung and they said that the phone numbers have to be reconfigured with the server but that still didn’t fix my problem. They said next will be new sim card, master reset and possibly a phone replacement but if others are having this issue then why haven’t they fixed it? I don’t want to hard reset or replace the phone if this is a wide spread issue. ugh, so frustrating. Exact same problem as EB. I have an unlocked S7. Bought it refurbished through Best Buy in April. Worked perfectly until the update. After the update, the first text will send and get delivered immediately although it will scroll like it’s sending for 2 minutes and say it failed. t takes 2 minutes for every text to send and will only send one at a time. For instance, if I send 4 texts one right after the other, the first one gets delivered immediately, every one after that takes 2 minutes each to get delivered ( 4 texts take a total of 6 minutes). They all come back as failed. I did a factory reset, started in safe mode and everything in between. Talked to all the tech people and their brothers and finally called Samsung. They told me to take it to Best Buy’s Samsung tech guy to have the operating system and update reinstalled . Texting was fixed after that but my gallery and Samsung Cloud stopped working. I dealt with that for a few days and then there was another update installed. Surprise, surprise, now I’m back where I started!! Going to try the reinstall again in couple of days at Best Buy but I’m guessing the same thing will happen. Something in the system is preventing the updates from installing correctly. New phone, only 30 day warranty because it’s refurbished. Anyone find a solution, please pass it on. Thank you. I returned phone to Samsung. They performed a system reset on it. When I got it back I was able to send text messages ok first few times I tried it. The phone again performed a system update, and now the errors have reappeared. There is something wrong with the system updates Samsung is using. Exactly the same issue as the last 2 comments, has there been any update on this???? I too have a Samsung S7 edge and just started experiencing the same issue as EB posted. When sending a text, the recipient receives the text, however, Messaging app reports “Sending Failed”. Tried all above troubleshooting steps including a hard reset. Received a new SIM from service provider, however, the same issue. No issues with calling, surfing, or receiving texts. It happened not long after the latest update from Samsung. I have a S7 Edge purchased on 4/10/2017 from Samsung that was upgraded by Samsung to Nougat in May. On 6/9/2017 Samsung performed a system update on the phone. Now the Samsung messaging app is not working correctly. When I send a text I receive a “Not Sent. Tap to send again” error message about 3-5 minutes after message is sent. It then gives you option to resend, delete or edit. Most times but not always the message is actually sent. I have cleared cache, tried messaging in Safe Mode and tried other messaging apps, but the problem persist. This issue didn’t start until the 6/9/2017 update Samsung performed.